Purpose Increasing evidences revealed that cancer cells with the characteristics of epithelial-mesenchymal transition (EMT) or cancer stem cells (CSC) have high ability of progression, invasion, metastasis and chemoresistance. TWIST1 and BMI1 are crucial transcription factors required for EMT and CSC. Both TWIST1 and BMI1 are up-regulated in various cancers and have a positive correlation with poor prognosis. Although recent results showed that the two molecules function in promoting cancer metastasis and chemoresistance respectively, the correlation of TWIST1 and BMI1 is not well understood. Methods In this review, we summarize recent advance in cancer research focus on TWIST1 and BMI1 in cancer metastasis and chemoresistance, and emphasize the possible link between EMT and CSC. Results Further investigation of TWIST1 and BMI1 cooperately promote CSC proliferation due to EMT-associated effect will help to understand the mechanism of tumor cells metastasis and chemoresistance. Conclusions TWIST1 and BMI1 in cancer cells will be effective targets for treating chemoresistant metastatic lesions. Metastasis is vital for tumor cells to migrate, and locate to distant organs. Epithelial-mesenchymal transition (EMT) is a crucial event for cell dissemination of epithelial tumors. Epithelial malignant cells connected with their neighbors and basal membrane. By pleiotropic cytokines and several signaling pathways, epithelial cells lose their polarity and cell-cell contacts step by step, finally become mesenchymal phenotype which facilitates migration [1-5]. Cancer stem cell (CSC) is the concept describes neoplastic tissues with self-renewing and stem-like cells characteristics, this highly tumorigenic cell type can play a pivotal role in cancer progression [6-8]. TWIST1 can promote EMT, and is widely expressed in human cancers. High expression of TWIST1 points to high rate of metastasis, chemotherapeutic resistance and poor prognosis [9-11]. BMI1 is a member of polycomb group (PcG) family. The stemness feature of BMI1 makes it vigorous in the involvement of tumor onset and progression. Meanwhile, the expression of BMI1 is increased in numerous cancers, researchers also confirmed that knock down of BMI1 ameliorated tumor initiation and metastasis [12, 13]. TWIST1 participates in CSC, and TWIST1-BCL2 dependent pathway can surstain CSC . Epigenetically, MTDH can facilitate histone H3 acetylation on the TWIST1 promoter, and then increased TWIST1 drive the CSC expansion . Ying Kong et al. found that Hedgehog pathway maintains the tumor-initiating cell like properties by controlling the expression of TWIST1 and SNAIL. To understand whether TWIST1 plays in EMT and CSC closely connected to each other, Benjamin Beck et.al  measured the mechanism of TWIST1 induced tumor stemness and EMT, and they found TWIST1 was required for skin tumor initiation and maintenance. But this tumor stemness is independent of EMT induced by TWIST1. Another study also shares the similar view with the evidence that uncoupled role of TWIST1 played in EMT and CSC . The authors found that turn on TWSIT1 in breast cancer cells can induce EMT while stem cell like traits arised only after TWIST1 deactivation. Contrarily, there are reports about TWIST1 plays in EMT induced CSC or CSC induced EMT. Yiwen Chang et al. induced EMT by exposuring to extracellular ligands and that could not sufficiently promote cell to form spheres in culture over 4 serial passages. Since among TGFβ, WNT3A, WNT5A, BMP4, only WNT3A can promote CSC phenotype. The authors then assessed CSC states using chromatin immunoprecipitation with high-throughput sequencing, and they found that a switch from β-catenin/E-cadherin/SOX15 complex toβ-catenin/TWIST1/TCF4 complex after WNT3A stimulation. The latter complex binds to CSC-related gene promoters and facilitates to generate CSC properties. It turns out WNT pathway induced EMT can generate CSC ability. What's more, other researchers showed that the epithelial ovarian stem cancer cells can generate mesenchymal cells with migratory and tumorigenic capacity both in vivo and in vitro . TWIST1 played in EMT and CSC and they did interact with each other, whether EMT induced CSC or CSC induced EMT. Kinue Kurihara et al. demonstrated that BMI1 was important factor in the promotion of EMT and invasion of tongue squamous cell carcinoma. BMI1 repressed the expression of mir-200 family, which were suppressors of EMT program . Researchers found that mir-15a inhibited cell proliferation and EMT in pancreatic ductal adenocarcinoma via the downregulation of BMI1 . What's more, BMI1 also played a role in the human telomerase reverse transcriptase-induced immortalization and EMT . To address whether BMI1 can promote EMT and CSC at the same time, the authors tested the expression of BMI1, mammosphere ability, in vitro and in vivo metastatic ability after adding Estrogen receptor-αin to the breast cancer cells. And they found that Estrogen receptor-αinhibited EMT and stemness through the down regulation of BMI1 . Besides, studies also showed that BMI1 regulate EMT and self-renewal ability by upregulating NANOG through the NF-kB pathway . TWIST1 has been identified as a putative oncogene and a key regulator of cancer metastasis . TWIST1 is overexpressed in malignant tumors, such as breast cancer, esophageal squamous carcinoma, thyroid cancer, lung cancer, gastric carcinoma, colorectal cancer, hepatocellular carcinoma, pancreatic cancer, cervical carcinoma and it usually associated with poor prognosis [28-31]. Ng et al. reported that TWIST1 induced N-cadherin to promote invasiveness in trophoblastic carcinoma. TWIST1 cooperates with KRAS to induce lung tumorigenesis by suppressing cellular senescence programs . What's more, DiMeo et al. observed that the down-regulation of the TWIST1 expression reduced lung metastasis in vivo. MicroRNA can regulate carcinogenesis through affecting co-factors of EMT inducers. In invasive endometrial cancer cell lines, microRNA-106b can inhibit EMT through suppressing TWIST1 . Seven microRNAs (miR-300, 382, 494, 495, 539, 543 and 544) can suppress EMT-related signaling network comprising TWIST1, BMI1, ZEB1/2 thus inhibit cancer progression . BMI1 was upregulated in various cancers. High level of BMI1 in tumors of nasopharyngeal carcinoma patients was correlated with worse prognosis . Furthermore, elevated BMI1 expression linked with poor prognosis in leukemia, as well as neuroblastoma, glioblastoma, hepatocellular carcinoma, and salivary gland cancer, lung, breast, gastric, ovarian, colorectal, prostate, and osteosarcoma cancer [37-40]. Researchers suggested that in neuroblastoma, BMI1 inhibits tumor suppressor gene including p14ARF, p16INK4a, KIF1Bβ, TSLC1 . BMI1 can activate the WNT pathway by repressing Dickkopf (DKK) family of WNT inhibitors to facilitate tumor progression . Studies revealed that BMI1 and TWIST1 cooperated in cancer differentiation and metastasis [43,44] (Table 1). TWIST1 can promote chemoresistance in human cancer cells. In breast cancer cells, TWIST1 expression has been shown to form resistance to paclitaxel through binding to AKT promoter and enhance its transcriptional activity . Zhu et al. showed that in cervical carcinoma, TWIST1 RNAi partially reversed MDR phenotype, such as suppressing cell proliferation and sensitizing cells to cisplatin treatment. High TWIST1 expression were strong indicators of postoperative recurrence of esophageal squamous cell carcinoma patients . TWIST1 was overexpressed in chronic myelogenous leukemia patients who predisposed to develop chemoresistance against standard treatment with tyrosine kinase inhibitor imatinib, and this imatinib resistance was connected with acquisition of EMT phenotype and high aggressive and invasive growth . The ability of cancer cells to evade senescence and apoptosis under treatment of chemotherapy was helpful to tumor progression and metastasis. BMI1 can protect tumor cells from suffering apoptosis and it is responsible for the chemotherapy failure . Experimental reduction of BMI1 protein levels using siRNA leaded to apoptosis and senescence in tumor cells and increases susceptibility to cytotoxic agents [37, 40]. BMI1 also has another way to protect cells from senescence and apoptosis though suppressing oxidative and DNA damage stresses . Artemin can stimulate radio- and chemo-resistance through upregulating TWIST1 and BMI1 . TWIST1 and BMI1 expressions in different cancer types with cancer chemoresistance are presented in Table 2. TWIST1 has been demonstrated as biomarker for prediction of poor prognosis in nasopharyngeal carcinoma, esophageal squamous cell carcinoma, oral cancer, tonsillar squamous cell carcinoma, breast cancer, lung cancer, colon cancer, prostate cancer, malignant pleural mesothelioma, osteosarcoma [19, 49-57]. 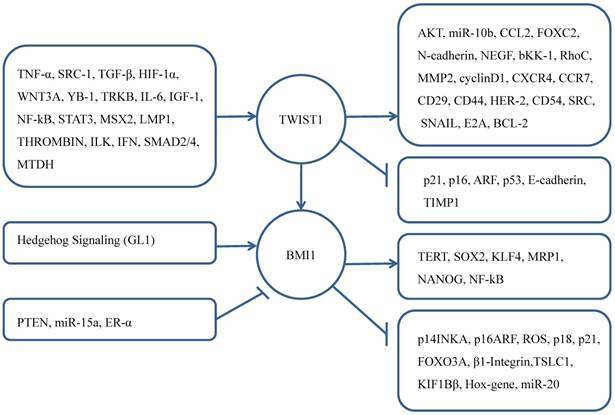 TWIST1 and BMI1 contribute to a series of processes that affecting cancer proliferation, progression, invasion, metastasis and chemoresistance. BMI1 also has been confirmed its progsnotic indicator role for brain tumors, head and neck cancer, tongue cancer, esophageal squamous cell carcinoma, lung adenocarcinoma, gastric cancer, renal cell carcinoma, colorectal cancer, ovarian cancer [58-66]. As a regulator of EMT, TWIST1 participates in the cell proliferation and apoptosis processes. There are many upstream regulators of TWIST1 promote these vital process such as ARF-p53, NF-kβ, AKT, WNT [11, 67-70]. As a core effector of cell self-renewal activator, BMI1 was influenced by other genes that promote cell proliferation contributing to CSC [71-77]. Knockdown of BMI1 in TWIST1-overexpressing cells blocked both EMT and stem-like properties, while knockdown TWIST1 in BMI1-overexpressing cells reversed EMT and abolished stem-like properties. Researchers used quantitative chromatin immunoprecipitation assay to demonstrate that knockdown TWIST1 or BMI1 contributed to the decreased binding of the other molecule on both E-cadherin and p16INK4A . That explained the interdependent relationship of TWIST1 and BMI1 in cancer cells. What's more, NANOG controlled the expression of TWIST1 and BMI1 in the immunoedited tumor cells, and NANOG/TCL1A/AKT pathway can promote EMT- and CSC-mediated metastasis . Kun Liu et al. found that in the condition of hypoxia, TWIST1 and BMI1's cooperation can induce stemness by upregulating the expression of CD44 and OCT4. Increased vasculogenic mimicry can promote EMT. Therefore, TWIST1 and BMI1 must be interacted with each other, both are mutually essential for the EMT and tumor-initiating capability. More importantly, both high expression of TWIST1 and BMI1 can indicate poor prognosis of cancer patients [43, 80]. EMT plays a lot in the acquisition of invasive and migratory traits of many tumors[81, 82]. Studies showed that EMT can generate stem-like properties [83-85]. Some CSCs can turn to migratory CSCs under the effection of EMT and freely pass the vessles and lymphnodes, CSCs and cancer cells arising as the successors of EMT develop more resistant to conventional therapies [86-89]. Thus EMT facilitates the generation of tumor cells with self-renewal abilities needed for initiation of secondary tumors. Meanwhile, cancer-stimulated mesenchymal stem cells secrets Prostaglandin E2 (PGE2), IL-6,IL-8, Gro-αr which facilitates the CSC and EMT program in nearby cancer cells . EMT and CSC is closely related. The EMT-CSC model carries more implications in the biology and treatment of cancer . The research on EMT and CSC may find out more related genes affecting these vital processes. Therefore, the signaling pathways regulating EMT and CSC require more intensive investigation. Both TWIST1 and BMI1 have been reported to be associated with cancer progression, metastasis and chemoresistance, while both TWIST1 and BMI1 can promote cancer initiation and recurrence. Is TWIST1 and BMI1 build a bridge that connect the EMT and CSC through which they can activate the growth of cells and leads to migration and metastasis still needs to be explored. Recently, experiments results showed that Doxycyline, Sirtuin SIRT6 and RNA-based TWIST1 inhibition via dendrimer complex can target TWIST1 in lung and breast cancer cells, finally reduce its metastatic potential [91-93]. NaB (histone deacetylase inhibitor) can therapeutically inhibit BMI1 in tongue cancer cells . However, this is limited and more drugs that can target TWIST1 and BMI1 are needed for the effective treatment of metastatic cancers. Above all, it is of great clinical value to understand the molecular mechanism underlying the regulation of TWIST1 and BMI1 in the growth of EMT and CSC, and their cooperation to cancer metastasis and chemoresistance. EMT, epithelial-mesenchymal transition; CSC, cancer stem cells. We thank Ying Wu for English editing and critical comments.